The Energy Cooperative warns members of a recent scam designed to bilk people out of their hard earned money. As it turns out, this is not an isolated problem. Other utilities and cooperatives across the state are also hearing reports of scammers targeting e-mail inboxes. The scammers send a bogus invoice that directs members to a virus-infected site. No members of The Energy Cooperative appear to have been scammed, but we have received reports of members who have received e-mails followed by phone calls. It is difficult to determine where the e-mails have been generated, but the URL for the sender is registered in South Africa. The link in the body of the e-mail shows it being registered in France. 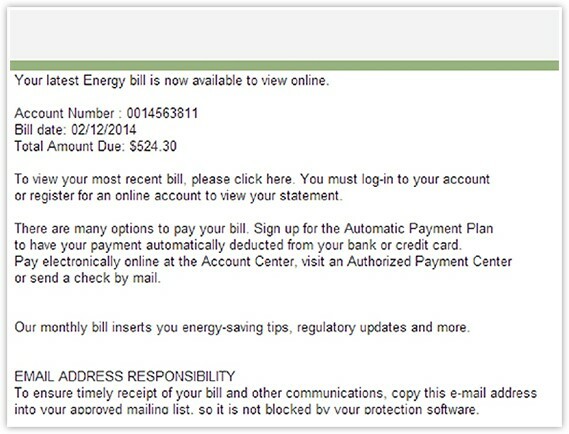 The fraudulent billing message tells member that their recent energy bill is ready and provides a hyperlink to view it. And that’s where the trouble begins. Reports say the link takes a person to a site that infects their device with malware. The malware can search for banking information or attempt to steal usernames and passwords. Better Business Bureaus around the country are seeing increases in phony utility company invoices, according to an official at the BBB (Better Business Bureau) service in Ohio. The Energy Cooperative advises members to ignore suspicious requests for personal information such as bank account numbers, credit card numbers, and user names and passwords. Members are also advised to not click on any link within a suspicious e-mail and delete those e-mails right away. If you receive an e-mail stating that your energy bill is available although you’ve never signed up for electronic billing, this is a signal that the e-mail is fraudulent. The Energy Cooperative cannot send your bill electronically without your permission. The Energy Cooperative takes all attempts to defraud consumers very seriously. Please be wary of e-mails demanding personal information, immediate payment or threatening termination of service. Members of The Energy Cooperative are urged to delete suspicious e-mails and call the cooperative at (800) 255-6815 to report them.